What happens if you don’t have enough deductions to itemize on your tax return? Good news! The tax professionals at Bryant & Associates, PC in Lincoln, NE indicate you can still claim some deductions on your 2016 federal income tax return. If you made a contribution to your traditional IRA for 2016, or if you plan to make a 2016 contribution by April 18, 2017, you may qualify for a deduction. The maximum contribution amount is $5,500 ($6,500 if you’re age 50 or older). Income limitations apply in some cases. Contributions to Roth IRAs are not deductible from your taxes. Health Savings Accounts (HSAs) are IRA-like accounts. They are set up in conjunction with a high-deductible health insurance policy. The annual contributions you make to your HSA are deductible. Most important, the contributions you invest grow on a tax-deferred basis. In addition, you’re allowed to withdraw money in the account tax-free to pay for your unreimbursed medical expenses. For 2016, you can deduct up to the contribution limit of $3,350 if you’re filing single and $6,750 when you’re married filing jointly. If you are age 55 or older, you may also be able to deduct an additional $1,000 as a catch-up contribution to your HSA. Student loan interest is tax deductible. You may be able to deduct up to $2,500 of interest on student loans for yourself, your spouse, and your dependents on your 2016 return. For 2016 returns, tuition and fees for qualified higher education courses is deductible up to $4,000. However, income do limitations apply. Furthermore, you must coordinate these deductions with other education tax breaks. 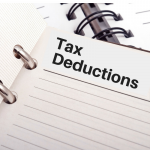 Let the tax professionals at Bryant & Associates PC be sure you get the maximum deduction. A small business owner, who is self-employed, is allowed many deductions. The cost of health insurance premiums are generally deductible. Small business owners can also deduct retirement plan contributions. Additionally, they can deduct one-half of self-employment taxes. Did you move during 2016? Certain moving expenses may be deductible. Are you required to pay alimony? Alimony payments are deductible. Did you incurred early savings withdrawal penalties? The penalties paid are also deductible on your 2016 return, even if you don’t itemize. Additionally, teachers can deduct up to $250 for classroom supplies purchased out-of-pocket in 2016. Bryant & Associates, PC is a full service tax preparation service in Lincoln, NE. Contact our tax professionals for more information on these and other deductions you may be able to deduct on your 2016 tax return. If you have any additional questions about your taxes or would like us to get started on yours, contact us at (402) 423-0404. Call us today to schedule an appointment!